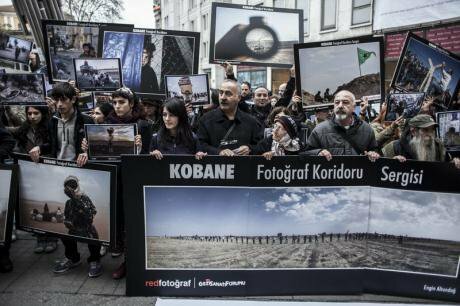 Kobane 'photo exhibition' shown in Istanbul, November 2014. Demotix/Erhan Demirtas. All rights reserved.News of the fight of the Syrian Kurds has reached many homes in Europe and the US over the last year as TV channels around the world have covered the resistance of the Kurds against Daesh (self-proclaimed “Islamic State”) in Kobane. The fighting was indeed a great human endeavor, often portrayed in heroic, almost mythological terms. 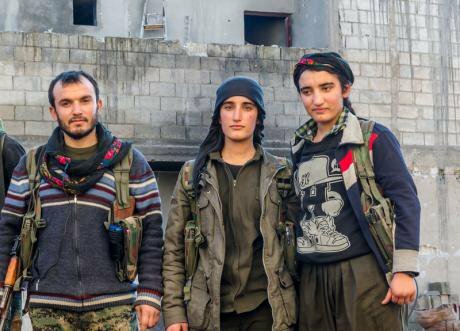 Behind the men and women fighters of this heroic resistance lies a large but still unknown political and cultural revolution which is in full effervescence in Rojava, Syrian Kurdistan. The Rojava model is based on two main pillars which may prove very efficient in the strengthening of democracy in the region. The first pillar is direct democracy as the basis of a communalist system in which citizens participate actively in decision-making and the management of the polis, from the neighborhood to the municipality and as far as the government. The second pillar, equally revolutionary, is the denial of the nation state structure and philosophy as such. In Rojava, many different religious and ethnic groups--Christians, Yezidis, Arabs, Turkmens, Chechens, Armenians--live together with the large Kurdish majority. By officially and insistently denying the nation state and by trying to create administrative structures that incorporate these different elements, the Rojava model gives to minorities a participatory role unprecedented in the Middle East – a role as equals in the management of the polis. "Don’t go with such a beard into Rojava in western Kurdistan in Syria, you might have problems. I’m serious", a friend told me in Istanbul, who knows the Kurdish regions of Syria. The last time I was in Iraqi Kurdistan, last June, once the first advances of the jihadis had begun, the Peshmergas seemed to look on me with suspicious eyes and they were checking me regularly. In the front line outside Mosul I had to convince the captain in charge that I was not working for Arabic media. So I decided to cut the beard before taking the long road to Rojava. When I told my barber in Istanbul he was happy enugh, although every time he combed my beard he was muttering "Mas’Allah" with sincere admiration. I climb on a long narrow iron boat with its motor trying to fight its way into the frail current of the river. And as soon as my feet touch Syria, a strong hand shakes mine and a voice tells me "welcome to Rojava". My driver is trying to talk to me but he knows only Kurmanci, the kurdish dialect of the Kurds in Syria and Turkey. On the other side of the Tigris behind us, in Iraqi Kurdistan, they mostly speak Sorani, another dialect. I only speak Turkish so we communicate more with sounds and signs. He smokes relentlessly and each time he takes taking a cigarette proposes one to me. And each time I smile and tell him that I don’t smoke. On the dirty dashboard two photos of young uniformed men with a big red star in the background. “Sehit,”, says my driver pointing at the photos. "Martyr". That’s how the dead fighters are referred to in this region. He explains to me that these two young men were his brothers. "Almost everything you see here comes illegally from Turkey. We have electricity three hours a day and those who can afford it live with generators. The city administration is also trying to distribute electricity from generators”, says Masud, my friend in Qamishli. "The greatest, the barbarian enemy is the jihadists. But we, women, are fighting on two fronts. One is here, the other is against the conservatism and the sexism of the traditional Kurdish society that does not recognize the equality of the sexes”, she says. “Daesh snipers. Let's go inside”, says Amara, the head of the company. We quickly enter the hovel, immediately unfolding a dark blanket to cover the window. 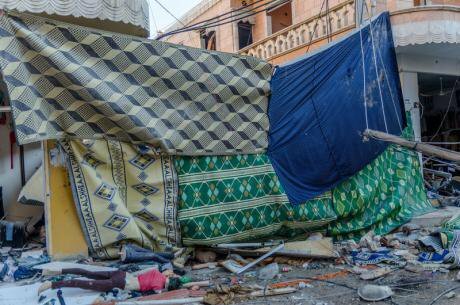 "During the day we have snipers and the night, rockets, so we need the blanket”, she says. Her name is Heza, 22 years old, and head of the heavy weapons’ platoon. Kobane 'veils', December 2014. Demotix/Jonathan Raa. All rights reserved.“We fight a war for freedom. The freedom not only for the Kurds but also for the Christians and Arabs and all the other communities living here in Rojava. And we also fight a war to have for all women equal rights with men in a society of equality and mutual respect”, she tells me. "We all have our orders to keep a bullet and a grenade in a special pocket on us. We can never become captives of Daesh. We will either explode killing jihadists with us or we will shoot ourselves with our last bullet. For us this is war to the death”, says Nupelda, showing me her bullet and her grenade. "We do not fear the jihadists. Here it is them who are afraid of us, because they say that whoever is killed by a woman does not go to heaven “, says Nupelda. "We want a democratic society, which incorporates all differences and where Kurds, Christians, Arabs and everybody else can live together. This would give women the place they deserve. These are the ideas of Abdullah Öcalan, this is our ideology. The struggle of the women here is not new, it has been going on for thirty years, ever since Ocalan started telling us about our rights. So here you see women at the forefront, but we have been fighting for years, "says Ammar. "We fear every day the jihadists who are not even thirty kilometers from here. But along with the fear, we have hope for our future. A different future, a future that will bring peace to all people living in Rojava”. "It's the first time we experience democracy. We try to make it so that all the inhabitants of Rojava have a good reason to live here without being oppressed. It is the first time across the region we women know what it is to have real, legal rights and to play a real role in public life. " “All of us we like to be beautiful and take care of ourselves. Even those women fighters fighting on the front line, I'm sure that if they were here they would like to put on a little makeup”, Judy says smiling. I'm now in the People's Court of Qamishli, part of the new justice system of the government of Rojava. We drink tea and talk with judge Ibrahim, his assistant and three lawyers. They explain how justice works much better than during the Assad regime. “It’s the first time I feel like a real lawyer and not like the decorative accessory of a fake justice ceremony”, one of the three lawyers, the eldest one, with white hair and a passionate gaze, tells me. Along with the legal and institutional changes, the widespread organization “Sara Against Violence" has launched a huge fight to change attitudes in society and to stop physical and psychological violence and social pressures against women. A long mournful cry fills the air. Women and children with restless eyes are hunched over a grave. A baby in his mother's arms is crying. "He was 21 years. It was my son. He was killed at the border with Iraq. So that there is no more terrorism, no more people who bring women into slavery. He died for democracy. So that all the different peoples of the Syrian Kurdistan can live united”. "We pay dearly, pay with blood the price of freedom and democracy. This war fell upon us like a whirlwind. But we will do it for freedom”. "We fight the war in your place. Because if we were not fighting this war, the terrorism of Daesh would come to Europe. We fight the war for our survival but also because we don’t want terrorism to spread. We don’t want the rest of the humanity to be infected by the barbarism of the jihadis”. The man I speak with is the uncle of a dead fighter. He was a 23 years old journalist who left his job to join in the People's Protection Units. His father is beside us, but silent. "He gave his soul as a gift to the Kurdish people and to humanity," says his cousin, a young girl with very good English. "Sometimes I feel proud that someone I knew as a child gave his life for Kurdistan. But most of the time the sorrow for his loss has no words to describe it”. "He died for something bigger, for an idea that you people in Europe have forgotten. He died for everyone who lives here in Kurdistan Syria, for freedom and brotherhood. Not only for the Kurds but also the Christians and Arabs who live with us. " "He fought with his Kurdish brothers. He died near Tal Marouf, close to Qamishli. We are all victims of the same barbarity”, says another man, mourning his dead Arab nephew. Front line in Kobane, December 2014. Demotix/Jonathan Raa. All rights reserved.We spend the night with Masud and his family discussing the future of Rojava. They are all eager to know how people in Europe see Rojava and its revolution. And they don’t understand why Europe doesn’t help them. "Over two years ago, when the jihadists arrived in Sarakaniyie, about 100 km from Qamishli, they proposed to the fighters of YPG to leave them 24 hours in the Christian neighborhoods of Qamishli and then they would withdraw without touching the Muslims. The YPG refused and continued the war. Without the YPG we would have been slaughtered or long gone". "We feel safe here in Syrian Kurdistan. As Christians our brothers feel confident in Iraqi Kurdistan too where they are protected by the Peshmergas. The Kurds have saved us from destruction", his wife says. "The government system of Rojava is the best for us Christians. Not just for Christians, for all peoples of Rojava, Kurds, Arabs, Chechens. It is a model for all of Syria. We want to stay in Syria, all of us here. We do not want independence, we belong to Syria. But a democratic Syria that respects human rights and differences. The Rojava model could be a model for the entire Middle East, which is emptying itself today of its last Christians ». The previous evening, I'm in the dark streets of Qamishli with two friends when we turn the corner and bump into three men with guns. Two with Kalashnikovs and the third man with an impressive shotgun. This is eleven thirty at night at Biseriye neighborhood, close to the center of Qamishli. The neighborhood is mixed, Kurds, Christians, Arabs. "We patrol from seven in the evening until seven in the morning. The whole neighborhood. Two shifts. Ours is the first, now at midnight we will change with the second shift». The man I speak with has a wide smile now. His name is Maurice. He is a Christian and the man with the impressive shotgun. "I was born here in the neighborhood that you see, and will never go away. And I protect it with my brothers the Kurds and the Arabs. So that people he can sleep quietly. So that my children and my wife sleep tight during the nights". "Here in Rojava all live together as brothers, no one will separate us. We all fight and resist against the barbarism of the jihadists. We want democracy, we want to be together. As here in the neighborhood Biseriye, everyone helps everyone, there are no dividing lines between Kurds and Christians and Arabs. " "The groups of citizens to protect neighborhoods are composed of volunteers who patrol all night. They control cars and anyone who enters the neighborhood if they don’t know him. They will not prevent anyone if he is OK but the jihadis can reach everywhere if we are not careful», says Mehsud, who has his face capped with a scarf. "I sleep peacefully at night because I know that my neighbors do patrols." From the window of Maria’s living room I see the church in the neighborhood. Her brother is a cantor. Her house is in the heart of the neighborhood. "We are all like brothers here. And the brand new administration gives us Christians a status that we have never had. We have always lived on very good terms with the Kurds and Arabs here but never had such equality in administration and politics". "The Kurds protect us. If it were not for the Protection Units of the People (YPG) and the Women's Protection Units (YPJ), the jihadists would reach here and we would all be slaughtered. And we have our own Christians fighting side by side with the Kurds. " "We are all together in this war. Side by side, one covering the other. In this war we are not just allies, we are brothers. There are no two different military forces working together, we are the same body that fights against barbarism”, he told me. 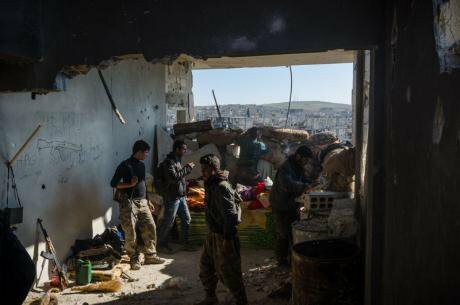 Kurdish YPG forces on frontline, December 2014. Demotix/Jonathan Rea.All rights reserved. "We believe in a better society. A society that we can build and where all the different nationalities of Rojava will live together. It can be done, it has already started with the building of the administration. I was born and raised in Switzerland. But something urgently called me in Mesopotamia, here, in the land of my ancestors. And I fight so that people don’t have to leave anymore from here, so that they are no more afraid to live here. " "Here in Rojava we believe that we can change mentalities and traditions, that we can make a difference in society. That's why we fight. Our struggle against the jihadists is only one aspect of Rojava, the other aspect is all this effort to build something new. A third way between Islam and secular authoritarianism” says Abdulselam, who has studied engineering in Damascus and now deals with translations. "The revolution made in Rojava is historic. Because it is a radical break with the past. Of course, we all know that these things take time, they don’t change from one day to another. It requires generations to change attitudes and societies. But we put down the first stones because we believe in change and democratic society. What we want above all is democracy and not independence, we want to stay as part of Syria, a democratic Syria that respects the rights of all the different nationalities as here in Rojava we respect all the ethnic groups in the region”, he says. The autonomy and the administration of Rojava are based on the principle of direct democracy, "a democracy from the bottom up," as Cinak Sagli, member of the umbrella organization "Movement of Democratic Society» (Tev-Dem) describes it. This umbrella-organization was set up around the main political party of Rojava, the party of the Democratic Union (PYD) but brings people from many other political groups and works to put into practice the principles of democratic government and radical/participatory democracy in Rojava. "This radical democracy is a system that enables citizens, all citizens who wish to get organized and to be actively implicated in the government at the local level. We start from the smallest entity, the Commune, at neighborhood level. Then we have the local assembly composed of representatives of the Commune and then we have municipal councils composed by representatives of local assemblies", says Cinak Sagli. This structure and the wider philosophy of this model of self-government going from the bottom to the top is based on the revolutionary approaches of the American libertarian socialist thinker Murray Bookchin who gave shape to ideas of communalism and radical democracy with a very strong participatory dynamic. Abdullah Ocalan was inspired by Bookchin’s ideas and adapted them to the circumstances of the region. Kobane, December 2014. Demotix/Jonathan Raa. All rights reserved.“We all help in one way or another, one is fighting in the front, another is translating texts. But we are free to get organized in the Tev-Dem or not, there is no obligation and there is no social pressure to be part of it”, Judy told me while we were eating sweetmeats in a tiny pastry shop. I am together with Abdulselam and his face lights up while he is talking. "A few years ago it was even forbidden to dream that we could one day try to live democratically. Today we can not only dream about it but we build our democracy stone by stone. You will see this for yourself when we reach Amuda”. "Rojava is not a Kurdish state nor a Kurdish administration. It’s the administration of Syrian Kurdistan made up of all different ethnicities and religions that have an immediate and weighty role in the operation of democracy and government. We want to remain in Syria, in a democratic Syria and our model here may be the model for the rest of Syria”, the co-chairman of the Parliament, Chakram Halo tells me. The principles of democracy and autonomous self-governing in Rojava are based on a "Social Contract", the equivalent of a constitution, that governs the operation and the organization of the political system. "We, the peoples of the democratic, self-governing region, Kurds, Arabs, Assyrians (Assyrian, Chaldean, Aramaic), Turkmen, Armenians and Chechens, with complete free will communicate that will we ensure justice, freedom, democracy and rights of women and children ... ". The denial of a nation state by the people in Rojava is a sign that the Kurds in Syria--and in that regard they fall in line with the thinking of the Kurds of Turkey--don’t want a separate state but an effective autonomy within a democratic Syria. Undoubtedly, behind this wise decision there is also a strategic vision of regional realities. If Kurds in Turkey and Syria insisted on a Kurdish independent state they would immediately spark hostile reactions from Ankara but also from Tehran who has its own Kurdish minority to deal with. In addition to that, such a demand would trigger reactions also from the international community. The difficulties encountered by the Kurds in Iraq in persuading regional powers but also the US and the international community of their cause of independence highlights the realistic limits of such efforts today in the region. "We want a democratic Syria and good relations with all our neighbors, Turkey and Iraq. We work to build a democracy here in Rojava. We are still in the beginning, we make mistakes but we are trying to build a democracy from scratch. And we believe that we can succeed”, tells me the president of the Executive Council, Akranes Kamal Chakoun. On our way back from Amuda, our car passes in front of the “security square", a large city block in downtown Qamishli still under the control of Assad’s forces. Over 500 regime soldiers and policemen control the airport of Qamishli, the only official way leaving Rojava. The regime forces sometimes come out of the "security square" and conduct controls but they seem largely to accept that Qamishli is under the control of the autonomous administration of Rojava. Everything in Rojava seems to be still in a grey area, somewhere between the old Syria and something new that has not yet taken shape. Between tradition and modernity, between gradual change and revolutionary overthrow, between war and peace. Spending time here is like spending time in a living laboratory where everything is on its way to being created. 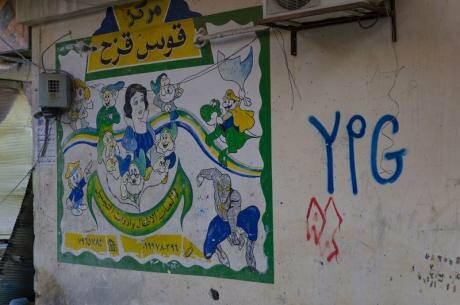 Up to now, no general elections have been held in Rojava, proving its democratic credentials. The first elections, municipal elections in Cizre Canton, were held on March 13, 2015. That was a first test. Meanwhile, the other dark shadow over Rojava’s democratic aspirations is the very problematic relation between the PYD and the main opposition parties, mainly those under the umbrella of the Kurdish National Council in Syria (ENKS). PYD and ENKS, under the leadership and the active sponsorship of KRG President Massoud Barzani, signed the Duhok agreement, in October 2014. The agreement is a framework for democratic relations between the PYD and the opposition, providing concrete arrangements for the inclusion of the opposition in the administration and the democratic process. But so far, thanks to various kinds of political prevarication, this agreement is not yet implemented. Many problems still exist, but the desire to find a consensus still seems to be on track.